Entdecken Sie auf dieser ganztägigen Sightseeing-Tour die zum UNESCO-Weltkulturerbe gehörende Kolonialhauptstadt Antigua, eine der bezauberndsten Städte Guatemalas. Ideal für Erstbesucher. Erfahren Sie, wie Antigua eine der ältesten Städte Amerikas ist. Folgen Sie Ihrem Reiseführer zu Sehenswürdigkeiten wie der San Francisco Church, dem Bogen von Santa Catalina, dem Casa Santo Domingo und dem Plaza Central. Bewundern Sie nach einem typischen guatemaltekischen Mittagessen (auf eigene Kosten) die kostbaren Edelsteine, die im Museo del Jade (Jademuseum) ausgestellt sind, und besuchen Sie eine lokale Kaffeeplantage, um mehr über den berühmtesten Export von Guatemala zu erfahren. Guide was very good and professional. Made a big difference in enjoying the city. For us it was worth the money. Excellent tour organized by Guatemalan adventure. Coffee tour is the best part. There was a misunderstanding of the places that we were taken compared to what was in the description. Contacted Lorena in the Guatemalan adventure was she was able to make it up by offering half day tour next day for free. Best customer service from Guatemalan adventure. Our tour guide Mirko Zea was nice too. 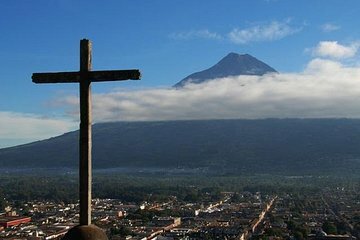 If you only have one day in Antigua, Guatemala this is a must! Excellent offering from Viator. Definitely provides a wonderful overview of this quaint, historical city. Mirko our guide was friendly, knowledgable and patient with our questions. Wear comfortable shoes as the majority of the city tour involves walking along the cobble stone streets of this fascinating city. The coffee plantation tour was a fantastic end to a wonderful day. Miguel the coffee estate guide was excellent! the overview of the festivals and instruments of the Mayans was an added treat! Highly recommend this tour!!! Interesting tour. Lunch was good despite the appearance of it. Our tour guide Armando was deaf and did not fully understand English so none of our questions were fully answered. Wish we had a different tour guide. Having had a previous positive experience using Viator, I booked the day tour of Antiqua and could not have been more pleased. Our guide, Mirko, was fabulous. The tour provided an invaluable orientation to the history and sites of this amazing city.